The maximum speed of Lastocka train reaches 160 km/h. Lastocka is a Russian version of the German Desire train designed by Siemens. Lastochka means “Swallow” in Russian - a very fast bird. Lastochka trains first appeared in Russia in 2013, and in 2014 they offered free passenger service in Sochi during the Winter Olympics. Seating carriages have soft seats and folding tabels like on the plane. 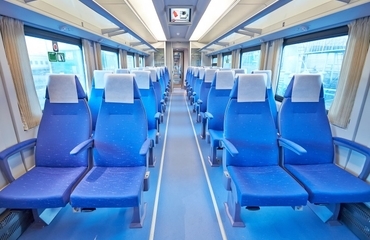 There are several classes of seating carriages, which differ depending on included services and seats arrangement. Carriage: better arrangement of seats; a/c, bio toilets. Carriage: seating; a/c; bio toilets. 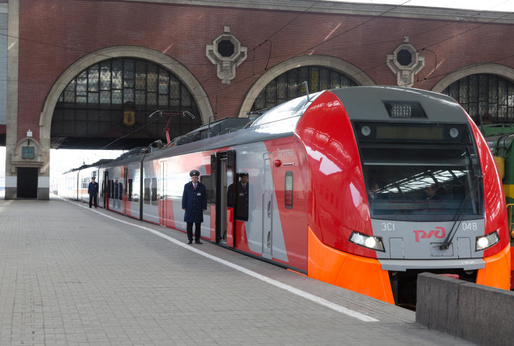 Lastochka train is a modern and faster alternative to Russian 'electrichka' (commuter train). It covers many destinations and connects major Moscow and Saint Petersburg with Nizhny Novgorod, Velikiy Novgorod and many other Russian cities and towns. Each train consists of 5 cars. Seat arrangement is 2+3. Sanitary and hygienic blocks are located in the head cars of the train. Their design allows passengers with disabilities to freely use them. Each car is equipped with a compact air conditioner, located on the roof of the car. Disinfection of recirculation air is carried out with the help of ultraviolet radiation.